First Day of My Life: Happy Blogversary to ME! I cannot believe I've been blogging for a YEAR. Yes - a year. My oh my how the time flies! Thank you to you for always reading & for being such a wonderful part of my life. The relationships I've cultivated through blogging is one reason I will never stop blogging. Not sure where this comes from?? Hmm! I'm happy that I'm useful for people wanting to be healthy! Whether they are looking for why they should juice or spring time fruits - people are finding me when they search for fruits! This one makes sense. Well, kind of. People are finding me when they look for thanksgiving but I think it more has to do with all of my Thankful Thursdays :) At least I would assume that. I reviewed hbl hair care in April - I guess many people are wanting to find out information about it before they purchase. Makes sense to me! If you've been following me for a while, then you know how horrible my luck is with nail polish - especially seche vite. I wonder if the seche vite people know this. But, seriously - no matter how you've found me - I am SO thankful for it. Thank you for making blogging enjoyable...for teaching me blogging tricks, for sharing your lives with me, for having fun, for being YOU! I've learned so much from each and every one of you - thank you. I have changed so much within the past year. I don't want to say it's because of blogging. There's many reasons for it. But I think blogging has helped me to find myself in many senses. To start - my love of learning...continuing to grow each & every day, to share my love of God with many of you, to remind me of the good things in life, to go for my dreams & not look back...so much. Happy Blogversary!! So much to celebrate! Congratulations on your blogoversary. I know I'm glad I stumbled across your blog! I rarely enter giveaways anyways. I'd rather learn about the blogger. Whaatt!?!? No massive giveaway!? Whatta bust! Haha, just kidding! I love your blog, I am so glad I found it...I especially love all those yummy pictures of tasty food! Haha, Happy Blogaversary to you! Keep posting!!! Happy Blogiversary, girl! Hope you have a great week! Happy blogiversary! We started blogging around the same time...my 1 year is in a few weeks. I have enjoyed reading your blog and becoming bloggy friends :) Hope you have a wonderful week! 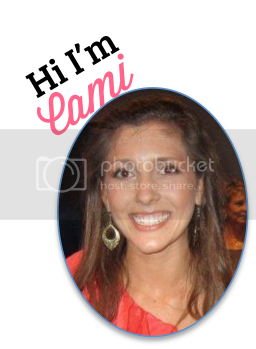 happy one year of blogging anniversary, cami!! i hope you're doing well and enjoying the summer.